Not many of us own a 3D printer yet but the time is near. We will own one when the price point hits home and what's the first command we want to download? 3D print toy car, of course. Unfortunately, the machines don't understand our commands yet, so until then we can save the code for our favorite 3D printable toy car. F&I Tools picked out a few to get us started. 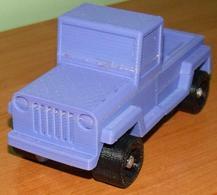 If you do own a 3D printer please send us a picture of your toy car after printing. Note to programmers: please develop code that allows car dealerships to include their logo on the cars to help spark an interest in 3D printers with our network of automotive dealers.